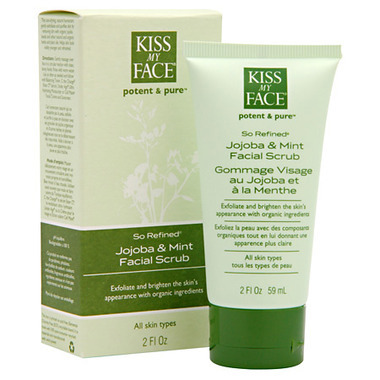 Exfoliate and brighten the skin’s appearance with organic ingredients. This non-drying, natural humectant gently exfoliates and purifies skin by removing dirt with organic jojoba beads and other natural and organic herbs and plant oils. Helps skin look visibly younger and refreshed. Aloe Barbadensis (Aloe Leaf Extract),* Helianthus Annuus (Sunflower Oil),* Cetearyl Glucoside, Glyceryl Stearate, Simmondsia Chinensis (Jojoba Oil),* Glycerin, Caprylic Acid, Panthenol, Glycine Soja (Soybean Oil),* Vitis Vinifera (Grape Seed Oil), Mentha Piperata (Peppermint Oil), Melaleuca Alternifolia (Tea Tree Oil), Xanthan Gum, Mentha Piperata (Peppermint Leaf Extract),* Melissa Officinalis (Lemon Balm Leaf Extract),* Lavandula Angustifoila (Lavender Extract),* Olea Europaea (Olive Leaf Extract),* Rosmarinus Officinalis (Rosemary Leaf Extract),* Roman Anthemis Nobilis (Chamomile Flower Extract),* Urtica Dioica (Nettle Leaf Extract),* Avena Sativa (Oatstraw Extract),* Eucalyptus Globulus Oil, Cinnamonum Camphora (Camphor Oil), Citrus Bergamia (Bergamot Fruit Oil), Lecithin, Tocopherol, Potassium Sorbate. Not the best scrub for my dry, thin skin. Dried out my skin, had dry patches on my cheeks. Awesome scrub! Very gentle with a nice minty smell. Leaves my skin smooth and glowing. Also helps clear up breakouts. This is a great facial scrub. I can use it daily since it's gentle, smells divine, and doesn't make me break out! Wonderful product.